He's dying to get rich . . .
With the aid of his wily servant Mosca, rich Volpone convinces the wealthy citizens of Venice that he is on his deathbed - prompting them to shower him with gifts in the hope that they will became his sole heir. 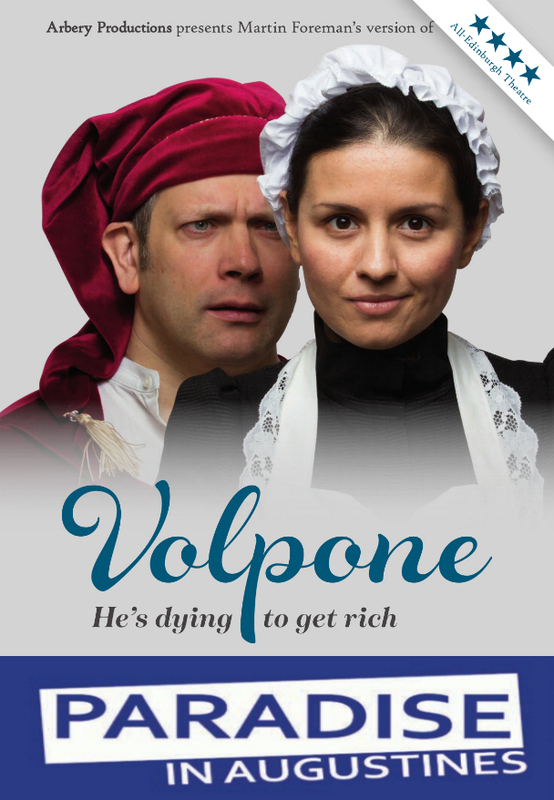 Buoyed by success, the pair persuade merchant Corvino to offer his beautiful wife to bring Volpone back to health. Meanwhile a trio of English tourists get involved in Volpone's schemes. How will it all end? time are retained, while others are added to keep the laughter coming. The greatest change comes in transforming two leading characters into women: Corbaccia, the old lady who disinherits her son to get Volpone's riches, and Mosca, whose quick thinking saves herself and her master from potential discovery and offers them even greater rewards. First presented in a one-week, four-star run at the Edinburgh Fringe in 2017, the production was enhanced and reprised for a three-week run in the 2018 Fringe. "A very enjoyable way to see one of the masterpieces of Jacobean theatre." Disappointingly for a three-week run of a well-known play in a popular central venue, only three reviewers came to Volpone. Surprisingly, when the production was agreed by many to be considerably slicker and funnier than the 2017 production, there were two three-star reviews. (The third, whose ignorance shone through his writing, offered two stars; see edfringereview.com below). One of the three-star reviewers praised several of the play's cast ("Standouts include Kate Cottam's grand dame, Lady Would-be, with Mike Brownsell as her lisping Mad Hatter-esque husband.") while lamenting a lack of energy (edfringereview.com - pdf version). The other praised the two leads (Alastair Lawless and Vanashree Thapliyal) and described the production as "very enjoyable " (fringeguru.com - pdf version). The public, were positive. "I really enjoyed this performance	... Go and see it." "A strong lead [Alastair Lawless] carries the title role ... Mosca is one of theatre's great parts, and [Vanashree Thapliyal] has good comic timing" the Fringe Box Office (pdf version).